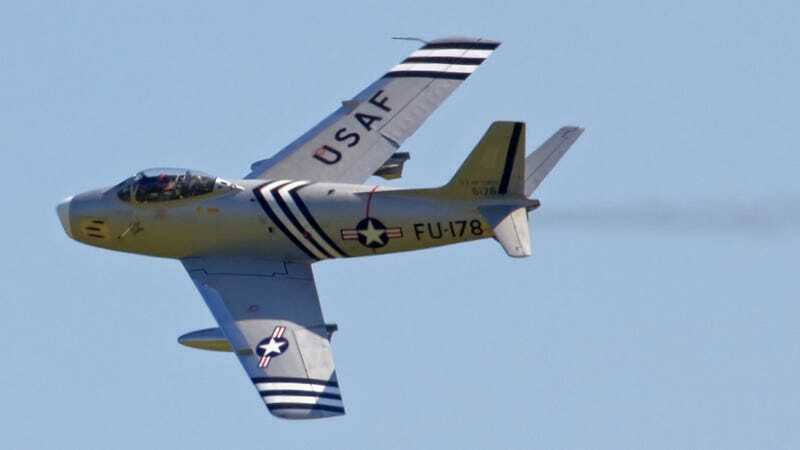 This F-86A Sabre is the world's oldest flyable jet. Built in 1948, serial number 48-178 has spent the last 22 years flying around Europe, at air shows. But now she has been shipped back to American soil, where she will be reassembled to resume her flying career. According to Global Aviation Resource, 48-178 was assembled in Inglewood, California, in February, 1948. It entered service with the U.S. Air Force in April, 1949. It flew with the Strategic Air Command, Air Defense Command and the Californian Air National Guard, including flying defense of the Los Alamos nuclear research facility with the 94th Fighter Squadron of the 1st Fighter Group, before eventual retirement and placement into storage pending use as a "Gate Guard." It ended up being sold to a technical college in Fresno, California, and then to a scrap dealer several years later. Still intact, it was purchased in 1970 by Ben Hall, who used two F-86As and over 10,000 man hours to make this one airworthy once again. It took to the skies again in 1974, flying regularly at air shows. On some occasions, it was flown by famous Air Force test pilot and air show performer Bob Hoover. It was sold in 1983 to John Dilley of Fort Wayne Air Services through to 1990. In 1990, the Golden Apple Trust took the plane to England. The Trust has a tag line of "machine-age heritage brought to life." It was displayed and demonstrated along with other vehicles and technologies of the 1940s and 50s. 48-178 is the fiftieth Sabre off the production line, and the only remaining airworthy F-86A. The Experimental Aircraft Association (EAA) is hoping the plane will be reassembled and airworthy in time for AirVenture 2015 in Oshkosh, WI. You really should watch the video above because it gives some closer views of the aircraft than the photos I was allowed to use under copyright rules. Global Aviation Resource has an an excellent in-depth history of the F86, and you can check it out here.